If your AC unit continually runs and isn’t cooling effectively, your home is not only uncomfortable, but your HVAC system is wasting precious energy and costing you money in high energy bills. Periodic maintenance is required to prevent Freon leaks which can contribute to your AC freezing up. By regularly cleaning the blower motor, it doesn’t have to work as hard. Clean blowers also circulate healthy air throughout the home. Dirty coils can reduce the efficiency of your air conditioning system, and the dirt and bacteria that accumulate on the coils can spread throughout your home. The U.S. Department of Energy reports that leaky ducts reduce HVAC efficiency by as much as 20%. Dirty ductwork and leaks can send unfiltered air through the home, aggravating allergies and asthma. Leaks in ductwork can also cause gas appliances to draw carbon monoxide through the home rather than being sent out through the home’s ventilation system. Cleaning and sealing your duct system can help prevent all of these problems. 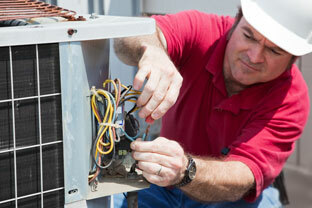 All of our repair services come with a comprehensive safety check of your HVAC system. Eco Pro Air provides AC troubleshooting with 24/7 AC Repair Service. We work with homes and businesses on tight budgets to make sure our prices are affordable, and we can beat any competitor’s written estimate. Our technicians are experienced in working on all brand names of HVAC units including Carrier, Lennox, Trane, Rheem, Amana and more. Call Eco Pro Air today to see how we can improve your AC efficiency and lower your energy bill.